One Mile to Beach. Walk to Wequassett. Minutes to Chatham Center and Shopping. Rates Include New 14% Rental Tax. Exceptionally Clean, Quiet and Convenient! 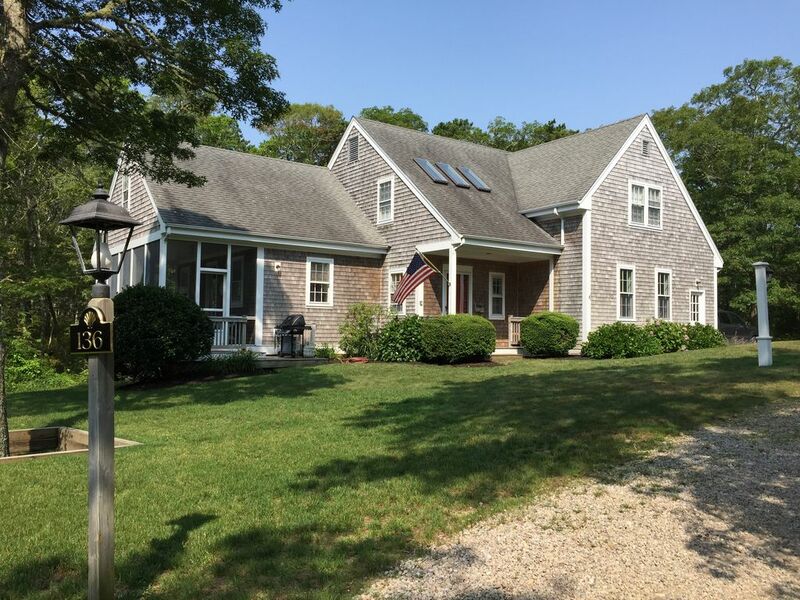 This comfortable and spacious classic Cape Cod-style house is custom-designed and offers bright, open rooms in a secluded, natural setting. Its location is superb: a family-friendly Pleasant Bay beach is minutes away. In the other direction, a large shopping area provides convenient access to groceries and other daily needs. Decorated with Pottery Barn furniture and fabrics, the house is fully equipped and extremely comfortable and features central A/C, cathedral ceilings, a wood-burning fireplace, French doors to a private deck and a Cape Cod summer must-have - a wonderful screened porch with wicker furniture and a large picnic table, ideal for morning coffee and pest-free lobster dinners and cookouts. Rent small boats, enjoy sunset cocktails or have a fabulous meal steps from the house at The Wequassett Inn, one of Cape Cod's most distinctive hotels. Launch your boat at Round Cove Landing. Jackknife Beach (ideal for children as well as paddleboarders, kayakers, and windsurfers) is less than a mile away. Sailing lessons - for adults and children - are offered daily at Pleasant Bay Community Boating. The size of the house and its proximity to both the Wequassett Inn and the Eastward Ho! Country Club makes it a lovely setting for wedding parties and is ideal for intergenerational family gatherings as the main floor is only two steps up from ground level. Have a Boat? Power boaters will find a convenient public boat ramp at nearby Round Cove ( which empties into Pleasant Bay) just minutes from the house. You can easily launch your boat, park your trailer at the house, and be on the water within 10 minutes. Love to Golf? For golfers, three fine popular public golf courses are also close by: Chatham Seaside Course, Cranberry Valley, and the Captains Course. Two Bathtubs - one in first floor Master Bath and second in upstairs hall bath. All linens provided, including beach towels. Please open flue before lighting fire. Close when finished. No more than 3 cars in driveway - town rule. Well-equipped with plenty of plates, glasses, serving bowls and cutlery and yes, a lobster pot. Lots of board games in living room cabinet. Boat rentals at Wequassett Inn. A screened porch with white wicker seating and a large picnic table makes summer dining delightfully pest-free! White wicker seating and large picnic table make summer cook-outs even more fun. Deck is accessible from both the living room and the master bedroom, offering a woodland view of the Indian Prayer Rock. ATTENTION SAILORS AND BOATERS! Small boat rentals are available at the Wequassett Inn while private Pleasant Bay tours are launched from Round Cove. Community sailing lessons - for adults and children - are offered daily at Pleasant Bay Community Boating.. I am so happy I found this beautiful home in Harwich. My nephew got married at Wequassett. The Goodfellow's home is not even a half mile away, which made it a much nicer weekend. We were able to walk back and forth when we were socializing with friends and relatives before the wedding. The house is so comfortable and everything was perfect when we arrived. I would definitely stay at your home again. Thank you for sharing your home. We stayed at the house for a family wedding at the Wequassett resort. House was just minutes away which made it ideal traveling with an infant. House was very nice, clean, and comfortable, just perfect for our family. Thank you! The house was in great condition and as described. We wish we could have spent more time at the house enjoying porch and location. The house was pure perfection. My group of 7 was in town for a November wedding at Wequassett and the house went above and beyond our needs. It had more than enough space to accommodate all of us, was perfectly clean, had an abundance of towels & sheets, and most importantly was truly walking distance away from the wedding venue. Betsy was a pleasure to deal with throughout the entire process. Couldn't recommend it more! Don't hesitate - just book it! Very,very nice house. Exceptionally clean. You really can walk to the Wequassett Inn. Good location. Nice beach very close. Pretty much everything you want is minutes away. We rented two homes on this street for family to stay in during our son's wedding at Wequassett, and this one was our favorite. It is well set up for family gatherings with great common spaces and a beautiful sun porch off the front of the house. The bedrooms and bathrooms are very large and well appointed - with everything you need. The skylights were an extra bonus - they were in just the right locations to allow us to enjoy the perfect weather. Thank you for your lovely review! The Wequassett Inn - where you can rent small boats, enjoy sunset cocktails or have a fabulous meal - is steps from the house. Jackknife Beach, ideal both for children and windsurfers, is less than a mile away. If you want to launch your boat, Round Cove landing, just off Pleasant Bay, is also within walking distance. Additional 3% Fee for Credit Card Usage. Check In and Check Out days: SUMMER - Sundays ONLY. SPRING and FALL - Flexible changeover days. Check In Time 4:00 pm Check Out Time 10:00 am Refundable Damage Deposit $500 All taxes included.